I've added a couple of webcam thumbnails to the right column of this weblog's main page. One is a view of the end of my driveway, and is there mainly so I can see how much snow I'm required to move before I can get my little car up the driveway. There's no bigger version of that one right now, as the camera's not the greatest quality. The other thumbnail is of a webcam in downtown Calumet on the northeast corner of Portland and 5th Streets. 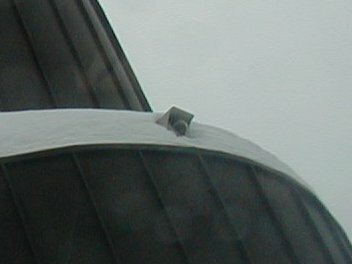 It's an outdoor PTZ camera, mounted on top of the first-floor canopy of the Miners & Merchants building. Here's a spy photo through my sunroof. Before I left for Minneapolis, I set up a web cam to keep tabs on Scout. So far, she's behaving herself. The guys in training with me are so impressed. Okay, they would be impressed if I weren't so embarrased about it. Quit with the donuts in my driveway.